Anatomically-contoured stabilizing orthosis ensures individual adaptation to the patient‘s shape for maximum comfort. Practical Finger pockets and lPT strap system (low Power Tension) mean that the orthosis can be fitted easily without the need to expend consider-able effort. How does LumboLoc Forte XT Work? Anatomically-contoured corset stays incorporated at the back facilitate an anatomically correct position of the orthosis, providing appropriate support. 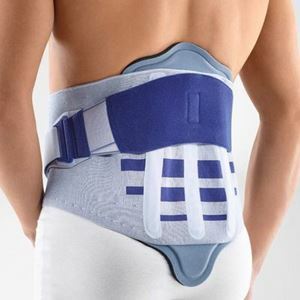 The adjustable function strap permits individual adjustment of the force exerted, with respect to location and intensity, and supports the effect of the pad. Rigid posterior panel provides enhanced sagittal control.